Our King Of Beasts max towing test is coming next week but we wanted to give you a deeper look at the impressive pair of trailers we used to carry our monster payloads with our 2013 Ford F-450 Platinum and 2013 Ram 3500 HD Longhorn. When Ram announced that its 2013 3500 dually pickups would have a 30,000-pound maximum towing capacity, the truck wars (especially the heavy-duty truck wars) were reinvigorated. Likewise, the 30,000-pound capacity ignited another race, this time among trailer manufacturers who now need higher-capacity trailers. A few companies were making large gooseneck trailers for the “hotshot” hauler crowd, but, for the most part, this is new territory for them.When Ram announced that its 2013 3500 dually pickups would have a 30,000-pound maximum towing capacity, the truck wars (especially the heavy-duty truck wars) were reinvigorated. Likewise, the 30,000-pound capacity ignited another race, this time among trailer manufacturers who now need higher-capacity trailers. A few companies were making large gooseneck trailers for the “hotshot” hauler crowd, but, for the most part, this is new territory for them.When Ram announced that its 2013 3500 dually pickups would have a 30,000-pound maximum towing capacity, the truck wars (especially the heavy-duty truck wars) were reinvigorated. Likewise, the 30,000-pound capacity ignited another race, this time among trailer manufacturers who now need higher-capacity trailers. A few companies were making large gooseneck trailers for the “hotshot” hauler crowd, but, for the most part, this is new territory for them. When Ram announced that its 2013 3500 dually pickups would have a 30,000-pound maximum towing capacity, the truck wars (especially the heavy-duty truck wars) were reinvigorated. Likewise, the 30,000-pound capacity ignited another race, this time among trailer manufacturers who now need higher-capacity trailers. A few companies were making large gooseneck trailers for the “hotshot” hauler crowd, but, for the most part, this is new territory for them. 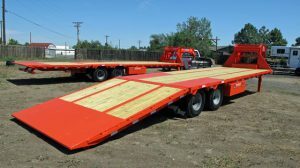 One reason that it’s difficult to find gooseneck trailers with a gross vehicle weight rating more than 26,000 pounds is that there is a federal excise tax on trailers with a weight capacity of 26,001 pounds or more. This particular road tax is 12 percent, so you can see why trailer makers didn’t rush into that market. Then came a little company named Load Trail. Load Trail, makers of just about every type of trailer, loaned us two 2014 Low-Pro Gooseneck Hydraulic Dovetail trailers for our recently completed King of Beasts extreme test. 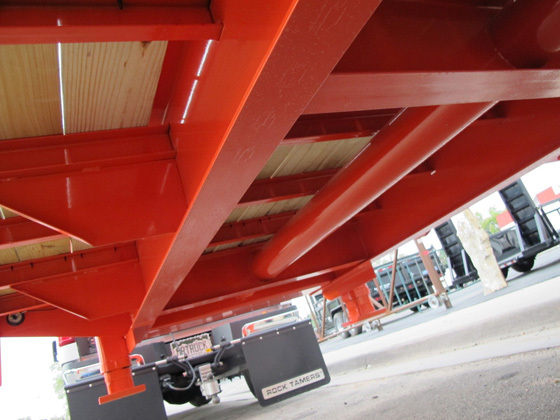 These heavy-duty goosenecks, called Load Max trailers, were sprayed Kubota orange because we thought that would make them easier to see, for us and other truckers. In fact, these trailers were so new we kept a close watch on the electricals and brakeline fittings, which needed occasional adjustments, even a few repairs, during our trip. It’s always a good thing to remember that when dealing with new trailers, you should always be prepared to make at least some of your own repairs. Thankfully, we were prepared. In the end we were able to complete all of our tests, but it did make for a few long days along the side of the highway making one or two on-the-fly road repairs. Load Trail manufactured the trailers to our specifications once we let them know that we had a 2013 Ford F-450 and a 2013 Ram 3500 HD. 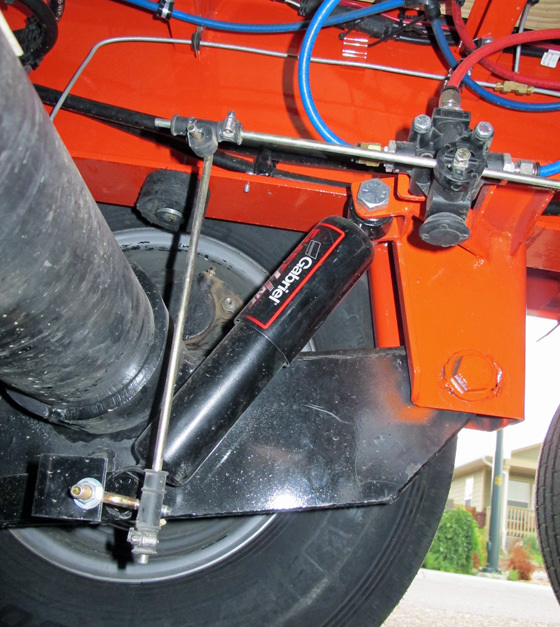 We opted for a pair of dualie 12,000-pound-rated axles underneath a 32-foot gooseneck flatbed. According to the manufacturer, that gave us a rated GVWR of 29,000 pounds. Loading the trailers to more than 24,000 pounds for our 1,600-mile test, we wanted the best brakes on the trailers to handle the Rocky Mountains’ 11,000-foot passes and steep 7 percent descents. We went with electric-over-hydraulic disc trailer brakes on the dual tandem axles; that was probably overkill, but we wanted to be safe. This is as powerful as it gets in a gooseneck without air brakes. We know stopping power is as, if not more, important than torque and horsepower when towing more than 12 tons. We also know Interstate 70 through Colorado has many emergency runaway ramps, but we never want to test one of those. 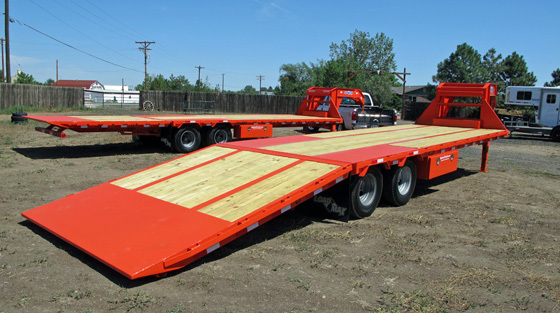 As a special feature on our Load Max trailers, each had a 10-foot hydraulic ramp, making it easy to load wheeled cargo like the 1942 World War II half-track troop carrier that we used in our 40-to-zero brake test and zero-to-40 acceleration runs. The hydraulic ramp makes the Load Max versatile, allowing you to load tons of material on the trailer, then drive the forklift onto the trailer (and strap it down) to help with unloading duties. 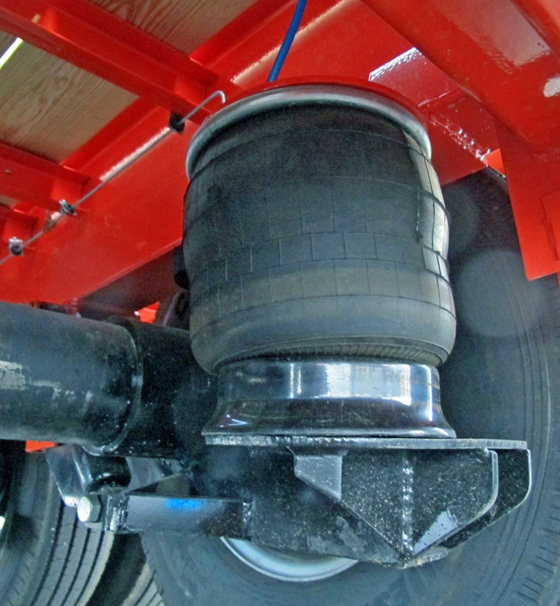 We chose a Trailer Flex air suspension system for our trailers to help keep things stable and level. Like tractor-trailer over-the-road rigs that have air-ride suspensions, Trailer Flex is a trailing arm airbag setup with shock absorbers that provide a stable and smooth ride. For the hotshot rig drivers who make a living with their trailers, air-ride systems will get them more jobs because there is less potential for goods to arrive damaged. During one part of our test route, U.S. Highway 191 (crossing from Arizona into Utah) was more like a motocross trail, but the Trailer Flex air suspension kept the trailers floating, while the trucks wanted to bounce like a basketballs. We even had one strap close to the gooseneck break because the hits were so hard. The empty weights of the trailers was 8,270 pounds, due in large part because of the over-built construction. That included a stiffened “pipe bridge” steel spine, 14-ply tires (just like the big rigs), 12-inch I-beam frame rails that sit flush with the trailer floor to keep load heights low, and oil-bath axle lubricated bearings (also like the big rigs). 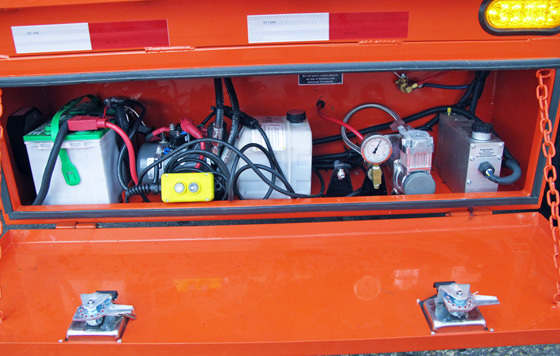 Lastly, we had several optional features, such as two 25,000-pound-capacity jacks, spring-loaded drop legs and chain racks at the front of each trailer. There’s no question that we couldn’t have done this test without this pair of strong goosenecks, and for that we thank Load Trail. We also want to thank Aaron Zbierski and his crew at Jayhawk Trailers for all their support as well. Look for all of the test data we generated, our impressions of the two trucks, and the spectacular photography of our trip on Monday. Load-Trail 2019 trailer preview below. Shocks with air bags for improved ride handling.